There are 26 Memory Care Facilities in the Sherman Oaks area, with 1 in Sherman Oaks and 25 nearby. The average cost of memory care in Sherman Oaks is $7,145 per month. This is higher than the national median of $4,650. Cheaper nearby regions include Van Nuys with an average starting cost of $3,175. To help you with your search, browse the 18 reviews below for memory care facilities in Sherman Oaks. Better rated regions include Northridge with an average rating of 5.0 out of 5 stars. Caring.com has helped thousands of families find high-quality senior care. To speak with one of our Family Advisors about memory care options and costs in Sherman Oaks, call (855) 863-8283. Promotion ends in 12 days! Sherman Oaks is a thriving Los Angeles neighborhood with 65,400 residents, including 8,200 senior citizens. An estimated 175,000 adults in Los Angeles County, or about 13 percent of people aged 65 and up, are living with Alzheimer's disease. More than two dozen memory care facilities aim to meet the needs of dementia patients in Sherman Oaks and the neighboring parts of L.A. State regulations for memory care facilities are enforced by the California Department of Social Services, Community Care Licensing Division. The cost of living in Sherman Oaks is almost double the national average, but it's only 26 percent higher than California as a whole. Similar to other metropolitan areas, housing and transportation are subject to the largest cost premiums. However, medical care is 15 percent cheaper than other parts of the country, which can benefit residents who have dementia and ongoing health care needs. Residents of Sherman Oaks have excellent healthcare access. Los Angeles is home to world-class medical facilities, including those specializing in brain health and dementia care, such as the Sherman Oaks Hospital, The Encino Hospital Medical Center and The Valley Presbyterian Hospital, in the event of medical emergencies or illnesses. The pleasant Mediterranean climate is one of Los Angeles' most attractive features. The area receives 284 days of sunshine. In the winter, temperatures sometimes dip below 50 degrees. In the summer, they soar into the mid-80s. Since older adults are more susceptible to heat, relatives may be interested in determining how memory care facilities maintain a safe, comfortable environment for their residents. As part of California's largest city, Sherman Oaks has a moderately high crime rate. Although the area has few violent offenses, property crimes, including burglaries, theft and vehicle break-ins, are fairly common. Annually, 344 crimes are reported per 10,000 residents. If safety is a concern, visitors may want to inquire about the facility's security features. Memory Care costs in Sherman Oaks start around $7,145 per month on average, while the nationwide average cost of memory care is $4,800 per month. It’s important to note that memory care rates in Sherman Oaks and the surrounding suburbs can vary widely based on factors such as location, the level of care needed, apartment size and the types of amenities offered at each community. Learn more about these programs, plus who’s eligible, on our Memory Care in California page. For more information about different ways to finance memory care, visit our Memory Care in California page. 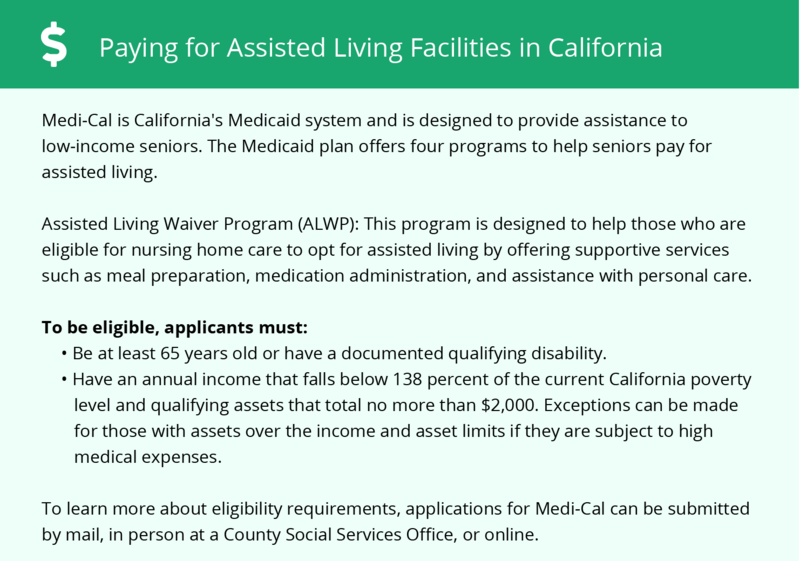 Sherman Oaks and the surrounding area are home to numerous government agencies and non-profit organizations offering help for seniors searching for or currently residing in an assisted living community. These organizations can also provide assistance in a number of other eldercare services such as geriatric care management, elder law advice, estate planning, finding home care and health and wellness programs. To see a list of free memory care resources in Sherman Oaks, please visit our Assisted Living in California page. 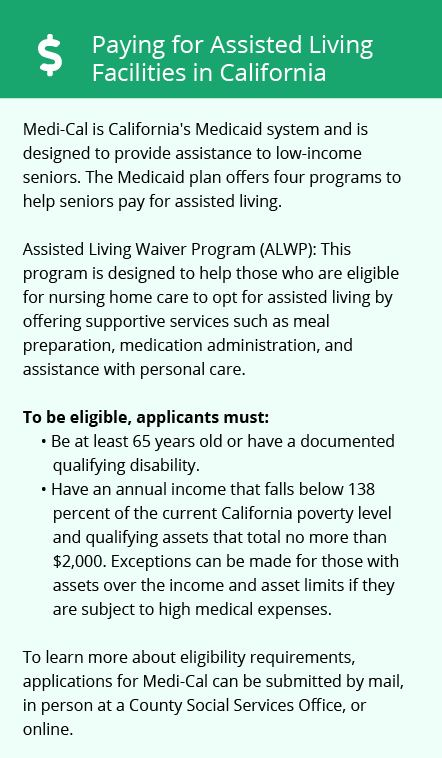 Sherman Oaks-area assisted living communities must adhere to the comprehensive set of state laws and regulations that all assisted living communities in California are required to follow. Visit our Memory Care in California page for more information about these laws.